Woke this morning to the usual pounding of rain on the roof the unusual sight of a bright yellow ball in the sky. After dredging back through distant memories we realised it must be the sun! Sort of reminds me of my time in Antarctica and how it’s possible for months to pass without sunlight. One now realises why the English can be preoccupied with the weather! She plans to use it to slow cook soups and casseroles. I’m to be chief taster! Two magnifying glasses. Amazing how difficult it is to find small things in a small boat. A quantity of cable ties. I still have to tidy the wiring around the Empirbus nodes. The sum total of our purchases for the day came to £3. Jan treated me to a meal in the scottish restaurant and became most indignant when the staff failed to deliver my second Big Mac. The terrier went to the counter and demanded the missing burger before we departed. It was placed in my backpack and carried around all day. I’ll have to find the enthusiasm to eat it later this evening or Ollie will claim it for himself! Not sure if swans like pickle? But then he may be a scottish swan! Jan and I walked 4km south out of the town centre down the A339 to the Retail Park where there is a Homebase store. No suitable pots there either! We took a slightly different route back down Newtown Road. At the southern end of the road is a car wash and on the opposite side of the road was this BMW for sale. A UK reader would probably think nothing of it. 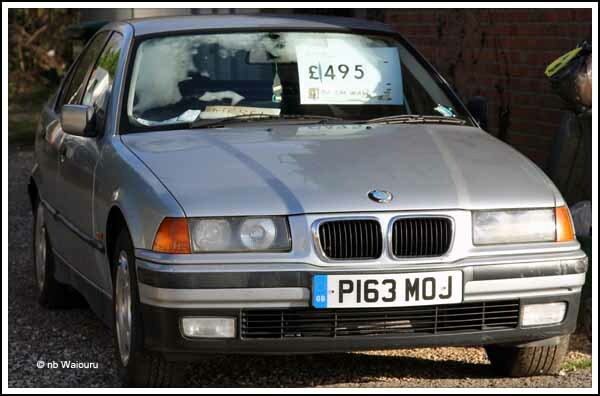 But many a kiwi reader would be thinking “A four door, 5 series, diesel BMW less than 10 years old, for £495…….. That’s an incredible bargain!” If you’re ever thinking of migrating to NZ take your car with you! Halfway down Newtown road splits into Newtown Road and Old Newtown Road. Much of the land between is occupied by an old cemetery. I though it was very old but apparently it was establish by an act of Parliament in 1847. That’s after New Zealand was established as a colony. Apparently the cemetery was a commercial operation with 800 shares sold at £5 each. The same Act prohibited any further burials in the Parish Churchyard (which was apparently full) and to do so could result in a £10 fine. To ensure the local clergy didn’t miss out on any revenue the Rector of the Parish would receive a fee of £2.2s.0d for a burial service related to a “vault, catacomb or brick grave” and 5s.0d for others. Even if the service was taken by an incumbent from another parish, the Rector would receive a fee of £1.1s.0d and 3s.6d respectively.. According to the Friends of Newtown Road Cemetery website the land was previously used for market gardens and there was an initial issue with water as the area had many natural springs. I’m fascinated by the idea that a closed commercial cemetery could have “friends”. 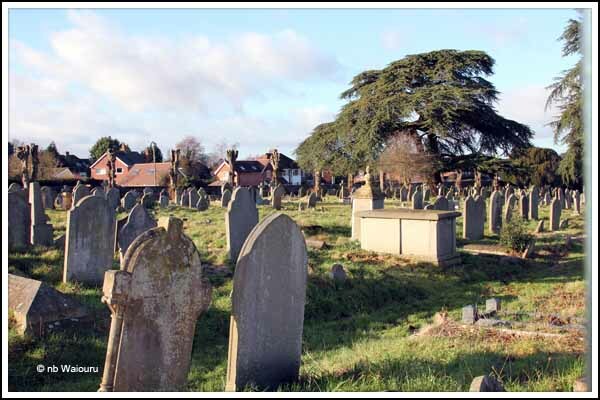 The northern half of the cemetery (closest to the town) was consecrated by the Bishop of Oxford and allocated to the Anglicans. 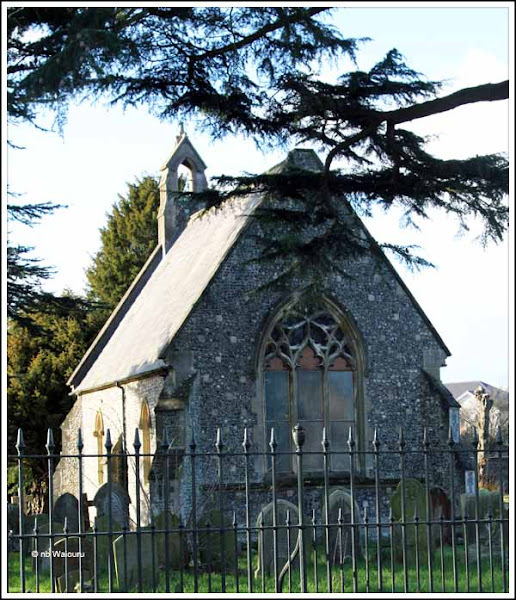 The southern half was allocated to ‘dissenters’ (Baptist, Congregational, Wesleyan, Methodist, Primitive Methodist, Presbyterian, secular and Catholic burials) who had their own mortuary chapel, called the Dissenters’ Chapel. This was demolished around 1951 after being damaged by fire. The Anglican Chapel is the only remaining building on the site. We had a lovely glass of Waiouru wine at my daughters yesterday to celebrate New Year, I toasted you both too!! It would still cost you at least three times more in NZ! Oh... I think the price of diesel in NZ is approx half that in the UK.